Boo! 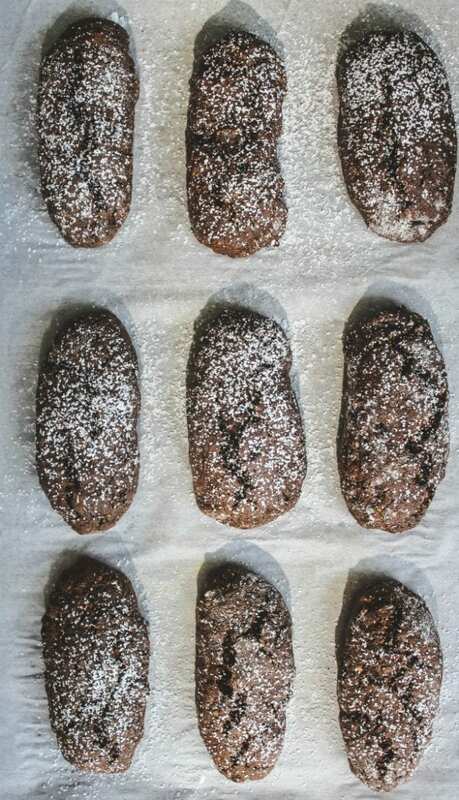 Today is Halloween and while you may browse the internet and find cookies shaped like bloody fingers and witch cupcakes, I’m sharing a typical sweet from Italy called Pan dei Morti, or Bread of the Dead. Let’s get one thing straight, this is not an actual bread and they may also be called Ossa dei Morti, or bones of the dead. And no, they aren’t made out of bones. 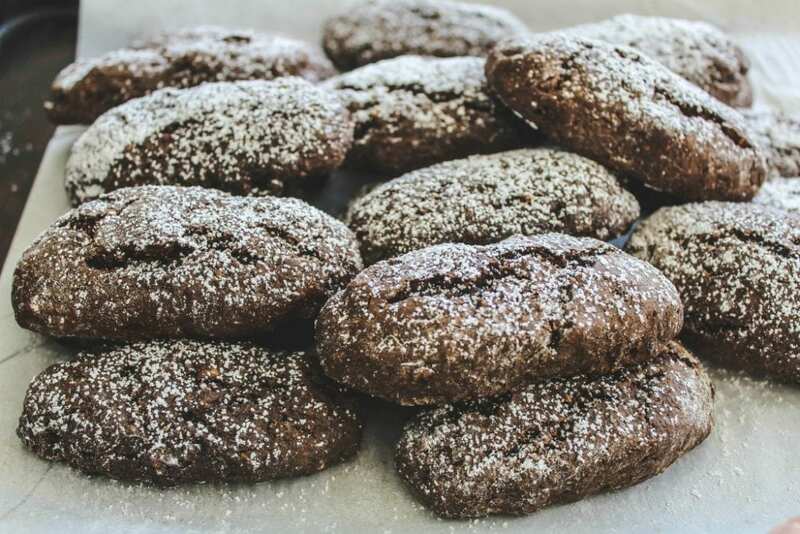 You’ll most likely find these cookies in various styles from region to region in Italy at a local bakery. They could be found just before All Saint’s Day and they’ll be gone after All Soul’s Day. 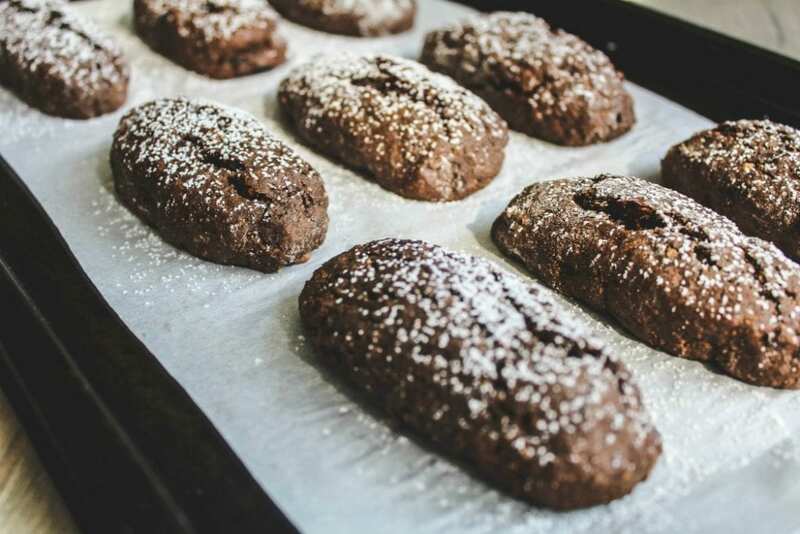 Pan dei Morti is an oblong shaped cookie dusted generously with confectioner’s sugar. Each bite features cocoa, cinnamon, nutmeg, nuts and wine. The crunch bite of nuts is supposed to remind you of your loved one’s bones, macabre, but that’s the story behind these cookies. What countries eat almond flavored cookies called Bones of the Dead Cookies? The bones of the dead cookies (ossa di morto) can be found at bakeries only for the All Soul’s Day (Day of the Dead) holiday in Italy (and many other countries). I was talking yesterday with a friend that just moved here from the Abruzzo region of Italy and she said she’s never seen a cookie for All Soul’s Day where she is from. Now I’m not saying it doesn’t exist in Abruzzo, but maybe just in her area she’s never seen it. As in many other Italian celebrations, special breads and sweets are made for the occasion and even an empty place is left at the dinner table for the ones that are missed. This particular recipe is from the Lombardy region (where my in-laws live). First you need to grind the almonds. Soak the dried fruit in the wine. Grind the amaretti and lady finger cookies. Cream the sugar, vanilla and eggs. Mix together the dry and wet ingredients and the Italian liqueur (if you’re using it). Cut the first long log in half, and then cut it into small sections. Cut each piece about 3 inches long. It makes about 3 trays with 12 cookies. Each cookie will not end up being the same, and I suppose that also makes them look more “bone like”. 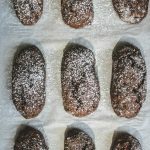 You could use amaretti cookies, lady finger cookies and even leftover Pan di Spagna cake (I think only in Italy you would happen to have leftover sponge cake laying around). The cookies get better on the 2nd day, so if you’re making it for All Soul’s Day, make it ahead of time. But they are also wonderful just baked. Preheat oven to 350F. Line 3 cookie sheets with parchment paper. On a baking sheet, toast the almonds for about 5 minutes. When they are cool, grind them (you could use hazelnuts or a mixture of almonds and hazelnuts); set aside. In a small bowl, soak the raisins and dried figs in the liqueur. Place the amaretti and lady fingers in the bowl of the food processor and finely grind them; set aside. Reserve the liqueur from the dried fruit and grind the raisins and dried figs; set aside. 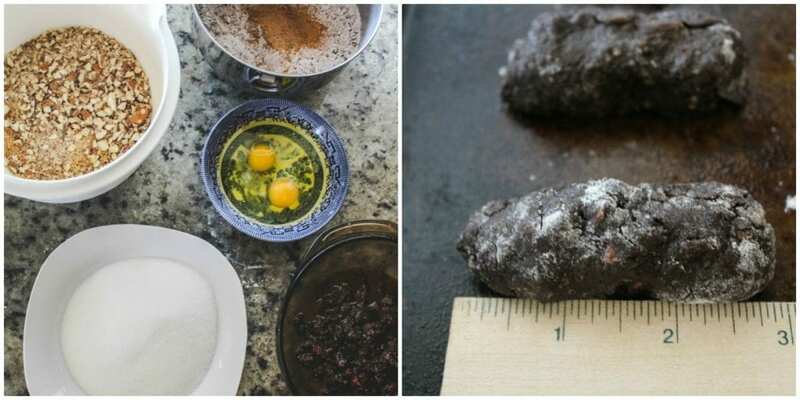 In a large bowl, sift together the flour, baking powder and spices. Whisk in the ground cookies; set aside. Be sure to stop the mixture while mixing to scape the sides of the bowl. In the bowl of a mixer, add sugar, the eggs, egg whites and vanilla. Mix until combined. Slowly add in the flour mixture. Mix until combined. Add in the dried fruit and a tablespoon of the liqueur. Keep adding the liqueur a teaspoon at a time until dough is combined (the dough shouldn’t be too wet). Remove the dough from the bowl and wrap it in plastic wrap. Chill in the refrigerator for 30-45 minutes. Lightly flour the counter or a pastry board. Cut the dough into 6 parts. Flour your fingers if it helps you work with the dough. Roll the first part of the dough into a rope that is about 18 inches long. Cut the rope into 2 parts. Cut the first section of dough into pieces that are about 3 inches long and 1 inch wide. Line them up with some space between them on the first baking sheet. Press down a little on each cookie and fix their shapes (the dough can be messy). Continue the process with the other parts of the dough. Bake for about 15 minutes. Dust with confectioner’s sugar. I absolutely LOVE these cookies! Such amazing flavor. These cookies look delicious! Definitely making some — I just worry they'll disappear too fast in my home! Wow, these cookies look very tasty! I want to try it immediately! It looks incredible. This recipe really impresses. THANK YOU! The flavors in this sound absolutely incredible, I can't wait to try them! I'm loving all the delicious flavors in these!